One sure way to end up in Davey Jones’ locker is to leave moisture rings on the Captain’s sloop. 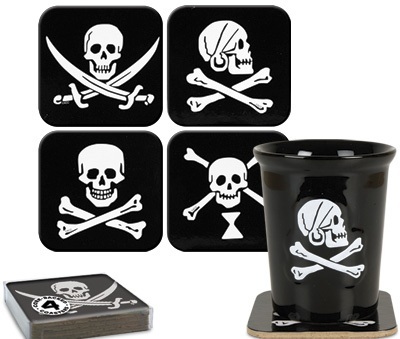 Each set includes four different, 4" (10.2 cm) square, cork-backed coasters featuring classic skull and crossbones images. Clear acetate box. Sorry but the grog class is not included. You can however buy grog glasses separately.